Tradition and teamwork thrive at Trenton Peabody H.S. After playing two quarters of football, John Horner heads to the field house to get hydrated and hear the coaches' instructions for the second half of the game. He immediately runs back to the field, picks up his trumpet and steps into formation to march his spot in the band's halftime show. There's no time for a uniform change; He marches the show wearing his football jersey. It's a common scenario for students at Peabody High School in Trenton, Tennessee, where teamwork and mutual support among activities are a way of life. "Our principal tells us to be happy for anybody doing anything positive," John says, "and that it's better for you to be into as many positive activities as you can." The school of 425 students is located in a close-knit rural community in west Tennessee. The small school size means that many students are involved in multiple activities out of necessity, butmore importantlyschool administrators support broad involvement because of the impact it can have on students' lives. John's band director, Keith Baumgardner, knew about the administration's support from the start. "During my initial interview, we talked about the philosophy at Peabody High School that kids should be allowed to be involved in more than one activity," Baumgardner says. "That's evident in the makeup of this year's marching band, which includes eight football players, plus several cheerleaders, soccer players and basketball players." For John and the other band students who also play sports, juggling their homework, workouts and band practice requires excellent time management skills. As John describes his daily routine, it seems the biggest challenge would be simply keeping track of where he needs to be at any given time. But he says the coaches and directors work together to minimize the overlap on their practice schedules. According to Mr. Baumgardner, the mutual support among coaches goes beyond synchronizing their calendars. Their support for one another is visible in very public ways. One of the school's traditions, which has taken place as long as any student can remember, involves the marching band and the football team. "We have a preview night at the beginning of the school year where the marching band presents its field show for the first time. The whole football team shows up to give support to the band," Baumgardner explains. 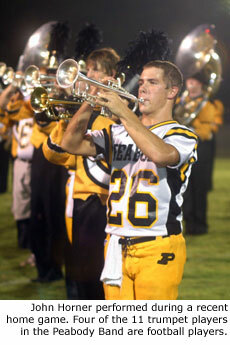 "The band in turn attends and plays for the football team's pre-season event called Meet The Players Night." The camaraderie between the band and football team continues throughout the fall season; At the end of every game the football team takes a knee in front of the band and sings the school song while the band plays. "This school is rich in tradition," Baumgardner says. "It makes for a great working environment." Mr. Baumgardner gives credit to Assistant Director Leigh Boyce for much of the band program's success. Boyce has an 18-year history with the Peabody "Band of Gold" and has faithfully carried on the traditions that have developed over the years. She also serves as band director at Rosenwald Middle School in Trenton, so she is able to expose her younger students to the traditions of respect and teamwork that they will experience at the high school level. The tradition of allowingor rather, encouragingPeabody students to be involved in multiple activities succeeds because of teamwork at many levels. It takes commitment from the students themselves, the band directors, other coaches and the administrators. John recognizes the value of being involved, and he appreciates the teamwork that enables him to be in band and play football. He encourages students everywhere to take advantage of opportunities that are available to them. He says, "Later in life, things don't come at you one at a time. If you take on more than one thing when you're younger, you'll handle things better when you're an adult." 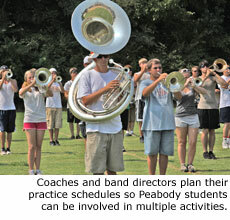 Photos courtesy of Peabody High School Band.